Companies can have the best Business Strategies imaginable, but if they don’t know how or where to execute them, then they are worth nothing! All parts of your Sales and Marketing organization, including Management, need to understand their roles and responsibilities to actualize what it is you are attempting to do. It is then imperative to direct that focus toward markets and customers that will give the best possible return on your investment in them. Funnel ScoreCard® provides sales organizations a method to quickly and systematically identify the best opportunities to pursue. This program offers the framework to make fact-based decisions around re source allocation and time management. For those concerned with improving forecasting, strengthening funnel integrity, and directing resources toward the right sales objectives, a customized Funnel ScoreCard® helps assess opportunity potential. 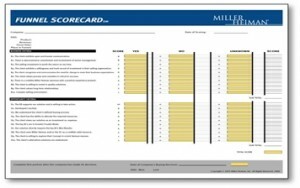 Additionally, this program facilitates win/loss reviews by using the ScoreCard to identify which criteria were met and what information remained unknown during the sales cycle. Every year, Miller Heiman conducts an exhaustive study of the best practices of over a thousand sales organizations. We offer you the opportunity to benchmark your sales organization against the very best. While benchmarking has been in vogue for years as a continuous improvement discipline, it is still relatively new to sales. Some of this comes from a lack of common language, definitions, and metrics across sales organizations, and some from a historical aversion or inability to measure top-line revenue influences to the same degree as other cost-centric functions. Conceptual Selling® Coaching* presents a comprehensive strategy to drive deeper adoption of Conceptual Selling®. By implementing this process, organizations will establish subject matter experts in the correct application of tools and concepts to improve implementation through on-going coaching and reinforcement. This program helps refine how managers and team leaders reinforce the concepts learned in Conceptual Selling®, motivating team members to adapt the communication behaviors most vital for ensuring productive conversations. * Conceptual Selling® for both the manager and the sales person is a prerequisite to this program. Strategic Selling® Coaching* provides organizations with a powerful way to support their overall strategy to reinforce consistent and proper application of the Strategic Selling® process. This program offers a mentor perspective with the objective of guiding team members in the ongoing use of the tools provided in Strategic Selling®. Strategic Selling® Coaching offers a consistent way to develop individual coaching plans to increase the use and effectiveness of the tools and processes by giving visibility into how thoroughly the team has adopted concepts into their every day sales practices. * Strategic Selling® is a prerequisite to this program.